Until two summers ago, I never dreamed that I would read a book that sympathized with a Nazi soldier. And I certainly did not expect to understand the author’s point of view. 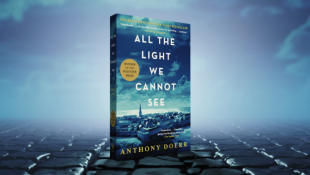 All The Light We Cannot See, by Anthony Doerr, tells the story of a young Nazi scientist, but he is not portrayed as the “bad guy”. At least, not completely. Obviously, it is impossible for anyone who was part of the Nazi regime to be innocent, or fully forgivable. Doerr, however, describes a boy who attempts to destroy resistance against the Nazi Regime, but is miserable in doing so. Werner Pfennig, that main character, is a genius. His knowledge of math and science, even as a child, blows everyone away. As a German orphan, Werner is sent to a brutal Hitler Youth training school, and soon enough he begins working for the Nazi regime, tracking illegal radio transmissions of the resistance. Werner was not on the front lines for the Nazis, but his work put the Nazi victims in even more danger. So why would anyone feel bad for him? The truth is, Werner hates his position, but does not believe that he could leave the Nazis. It is easy to think that Werner should have acted on his morals, and refused to assist the German army. However, if Werner rejected his assignment, there is a good chance that they would have killed him. I am not defending Werner’s choices, but I would imagine that putting your life on the line, even for a good cause, is easier said than done. The story also follows Marie-Laure LeBlanc, a young, and tragically blind girl. Marie-Laure lived in Paris, France when she and her father were forced to flee their home. The Germans were invading, and it was no longer safe to stay in Paris. Living with her uncle, Marie-Laure takes over a radio with illegal broadcasts. I find Marie-Laure to be a truly amazing girl. Not only is she unaware where her father is, much less if he is alive, but she bravely joins the resistance, despite the potentially fatal cost. All the Light We Cannot See alternates between Werner and Marie-Laure’s perspectives, but also includes many other characters that bring the book to life. Reading about World War II, especially the Nazis, is no easy task, so I would not recommend this book for middle-schoolers. While World War II can certainly be introduced in middle school, the details in this story are, not surprisingly, quite disturbing. I implore you to at least give this book a try; you won’t regret it. I’ve read quite a lot of historical fiction about World War II, as I find it an extremely interesting period in world history. However, All the Light We Cannot See stands out to me. Even after a year and a half, I still find myself contemplating the different messages and themes in the book, especially the question of what makes someone good, and what makes someone bad. Is it their intentions, actions, or something in between. If (or when…) you read this book, please let me know, because I would love to hear your thoughts.